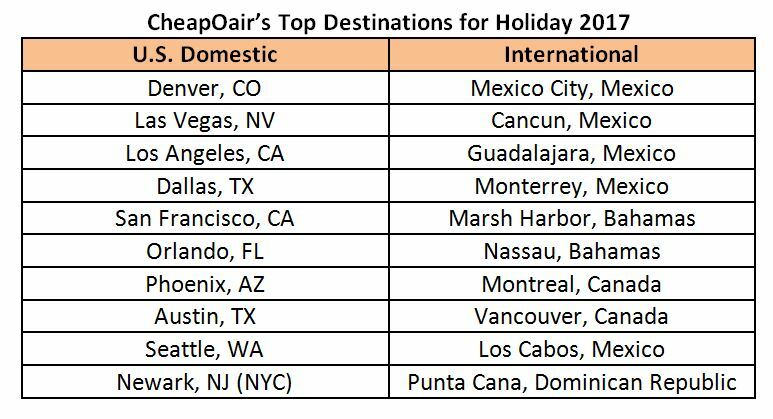 CheapOair®, the leading flight-focused hybrid travel agency, today announced its top ten domestic and international destinations for the 2017 holiday season. This year, Denver, CO, Las Vegas, NV, and Los Angeles, CA round out the top three U.S. domestic cities booked, accompanied by three Mexican destinations – Mexico City, Cancun, and Guadalajara – as the top three international cities booked. For this holiday season, CheapOair’s data reveals that average U.S. domestic airfare prices have decreased by 5% since last year, and they are down nearly 30% since 2013. *The data referenced compared YOY passenger numbers for travel from December 22nd through December 26th on flights from all U.S. origins from 2013 – 2017. Top destinations were determined based on passengers numbers for travel from 12/22/17 – 12/26/17 booked as of 11/4/2017.